BueLingo cattle were developed by Russ Bueling, a respected cattle rancher and grain farmer from the Sandhills of South Eastern North Dakota along with Alfred Ostrum and with the assistance of Russ Danielson, Professor of Animal Science at North Dakota State University. Mr. Bueling's dream about "the ideal beef factory" has become a reality with the BueLingo breed. BueLingo cattle are a composite breed. 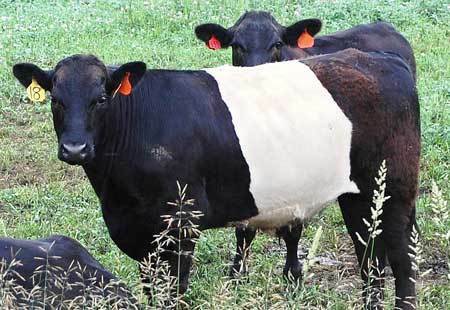 The distinctive belt is largely derived from the Dutch Belt dairy cattle infused with genetics from Scotch Highland, Belted Galloway, Angus, Chianina, Limousin, and Shorthorn cattle. BueLingo cattle have a striking appearance with a white belt and black or cherry red forequarters and hindquarters. They are moderately sized with female weighing between 1,000 and 1,200 pounds and bull weighing between 1,800 and 2,000 pounds. Birth weights typically vary between 65-80 pounds. Good carcass quality and modest marbling is accompanied by excellent taste. Fertility, desirable calving weights, vigorous calves with rapid maturation rates, excellent maternal instincts, and good dispositions are breed traits. They can be polled or horned.